According to new research from IDC, the iPhone has taken a hit in market share. The company found that for the first quarter, the iPhone saw its share of the US smartphone market being taken away by the likes of RIM and Palm, AP reports. The iPhone’s market share now stands at just over 19 percent of all smartphones, down from around 26 percent in the previous quarter. Meanwhile, RIM’s BlackBerry saw its market share jump in comparison, going from 35.1 percent of all smartphones in the fourth quarter of last year to 44.5 percent in the first quarter of this year and Palm saw its share grow from 7.9 percent to 13.4 percent of smart device sales. Why has Apple hit a bump? I m sure there can be many reasons to hit. It could be a post-Christmas shopping slump, new models from both Palm and RIM hitting the market and shoppers waiting for the 3G iPhone to surface. No. 4 Samsung Electronics, with 8.6%, up from 5.1% in the fourth quarter. Troubled Motorola Corp is struggling in the overall cell phone market, performed poorly in smartphones as well, dropping from a 7.5% share in the fourth quarter to 2.6% in the first. But i m certain the figures will change from June onwards. 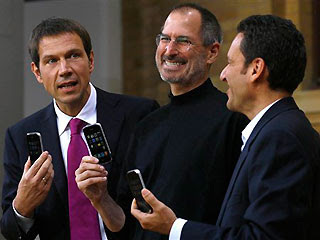 With the expected launch of 3G iPhone, I m sure the sales on iPhone will rock once again. Steve Jobs really know how to keep all of us at the edge.